Notice No.4 for Patients and Staff of SIVUH released at 10.00 Sunday 04/03/2018. All services will reopen as normal on Monday 5th March 2018. Patients who have had their appointments or procedures cancelled will be rescheduled in due course. SIVUH Management - Notification posted 04/03/2018 @ 10:51. All non essential services will be closed from 13.00 today, Thursday 1st March and will remain closed tomorrow, Friday 2nd March 2018. Sunday service will apply. Services will open as normal on Monday 5th March 2018. There are beds available to stay overnight for essential staff, please link with Nursing Administration. SIVUH Management - Notification posted 01/03/2018 @ 12:30. Patients who have been cancelled will be rescheduled for all appointments in due course. We apologise for any inconvenience this has caused to our patients; decisions as outlined above have been made in the interests of safety for our patients and staff. It has been suggested that staff living local to the Hospital be rostered for duty and you may wish to consider swapping rotas with colleagues to facilitate this. You Line Manager / Dept Head may be in contact with you in respect to this. If you are rostered for duty and unable to attend due to weather conditions please link with your Line Manager / Department Head as soon as reasonably possible to advise them of your position. It is important that we account for all staff rostered for duty. We understand the Defense Forces are not be in a position to assist staff members in getting to work. Communication from HSE has issued in respect to those unable to present for duty. The full memo has been issued to all users internally; briefly the national instruction at this time is that staff unable to attend due to poor weather conditions are to utilize annual leave / time owing. Should staff be unable to leave SIVUH due to weather conditions; you will be afforded a bed in a designated location. If staff wish to travel to SIVUH prior to commencing duty also a bed will be available again by agreement and in a designated location. Please link with ADON out of hours / nights. Thank you all for your co-operation. Stay safe. SIVUH Management - Notification posted 28/02/2018 @ 14:33. This Notification No 1 is now superseded by Notification 2 above. Given the inability to predict the weather at this time, SIVUH has not made a decision regarding Friday services. It appears however the poor weather conditions may also result in cancellations. Confirmation regarding Friday will appear by 1pm Thurs 01/03/18 on this page. Where staff are travelling and conditions are poor, it is recommended that people ensure their cars are stocked with supplies, (food / water / warm clothes / blankets). You are responsible for your own personal safety when travelling in such conditions. The Health Services play a critical role in periods of severe weather alerts in the delivery of health services to our most vulnerable citizens and possible victims of such adverse conditions. Our citizens may need our assistance even to a greater extent in such occasions. Health Services have contingency planning in place to ensure continuity of services at such critical times. The commitment and dedication of health service staff to maintain and in many instances enhance health service delivery in such circumstances is greatly acknowledged and appreciated. It is at times like this that the true value of public service comes to the fore and the work of so many unsung heroes across the entirety becomes even more evident. The following guidance is being issued in the context of the pending arrival of Storm Emma and the Met Éireann weather alerts which may escalate to the higher Red Alert warning over the coming days. · Stay informed of weather alerts to issue from Met Éireann in respect of their home locations and their work locations. · Familiarise yourself with local service continuity planning and their severe weather plan. These are available through your line manager. · Access information on safe driving as issued by the ‘Be Winter Ready’ campaign (available on the MEM.ie website), AA Roadwatch,and other motoring bodies as well as on local alerts as to road conditions in their areas of likely/planned travel. · Stay safe and avoid the many dangers that such adverse conditions may throw in your path. · Keep contact with your line managers and other colleagues. · Services will adapt locally to the severe weather challenges they face. In this context managers will liaise with staff regarding the local service requirements in the coming days. Where staff are scheduled to work and if for health and safety reasons they are unable to attend; those affected can use annual leave for the hours they were scheduled to work. If a staff member has no annual leave remaining, they may use leave from the next leave cycle, and have their leave allocation adjusted accordingly. Be safe and sincere thanks for your dedication, professionalism and commitment to your service in these challenging times. With SIVUH services returning to normal, the SIVUH would like to thank the public for its support and understanding during the recent severe weather. Our services are now running as normal and we expect them to continue as such. The disruption caused by the severe weather may have a knock-on effect for the week ahead where some services may be extremely busy. Out-patient appointments have recommenced today Monday 5th March 2018, and patients with an appointment are requested to attend as normal. In respect to cancelled services patients will be issued with new appointment dates. Over the past few days SIVUH have been working with the Gardaí, local authorities, other emergency services and other agencies through the NEOC and SSWHG, and we would like to thank all those agencies for their efforts which helped us to keep essential services running in difficult conditions. We would also like to acknowledge and thank our staff who worked tirelessly to ensure the impact to our patients and service users was kept to a minimum, in many cases going well above and beyond. Corporate Challenge Cycle Saturday 22nd September 2018, 60k & 120k Route Options. As the childrens ward will benefit from this we would greatly appreciate it if you or family/friends would like to partake. Please be advised that anyone interested in partaking in the corporate challenge must register on line . Mr Patrick Sheahan has been appointed to the Post of Associate Professor / Consultant Otolaryngologist at SIVUH and University College Cork. Professor Sheahan has been appointed on a full time permanent basis to this Academic post. This post encompasses an SIVUH commitment and a commitment to University College Cork. 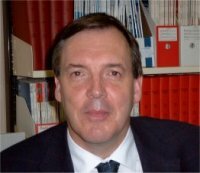 Professor Sheahan will assume his Professorship in ENT from Monday 4th September 2017. Dr Johnny Bourke will make a presentation to Professor Patrick Sheahan on behalf of the Friends of SIVUH to the Cork Head and Neck Cancer Charity at Paddy the Farmers on Friday 15th September at 5pm. The Friends of SIVUH have raised €15,000 for the charity through a golf classic, carol service, sales of a Hospital Cookbook, cake sale, pub quizzes and a variety of other events in 2016/2017. The funds will contribute to the purchase of narrow band imaging for the early detection of laryngeal cancer at the South Infirmary Victoria University Hospital. Anyone interested in taking part in the mini marathon on behalf of the Friends of SIVUH please email drjfbourke@gmail.com. We will provide T shirts/bibs and sponsorship sheets. Any help is gratefully accepted! GPs can now use the SIVUH Online Referral System to refer patients to Cardiology. July 2009. Pigmented Lesion Clinic – Dr Michelle Murphy. General Dermatology - Dr John Bourke, Dr Fergus Lyons or either Dr Bourke or Dr Lyons. Dermatitis - Dr John Bourke. General Surgery - Ms Deirdre O’Hanlon, Mr Denis Richardson, Mr Martin O’Sullivan, Mr Adrian Ireland. Otolaryngology Head, Neck & Thyroid Surgery - Mr Patrick Sheahan, Mr Gerard O’Leary, Mr Peter O’Sullivan. Plastic Surgery - Mr Sean T. O’Sullivan. Dr. Matthew Murphy commenced in the post of permanent Consultant Physician in Endocrinology & Diabetes Mellitus on 01/04/09. Dr. Brian O’Donnell commenced from 01/04/09 in the post of Consultant Anaesthetist (employed by BreastCheck). Click here to view press release 16/01/09. SIVUH Breast Unit gets top rating. Click here to view the article published in the Evening Echo 31/12/08. An Irish Times HealthPlus Supplement article regarding Patients presenting to the SIVUH skin clinic earlier than in other hospitals, published 2nd December 2008 can be seen here. Mr. Patrick Sheahan has been permanently appointed to the post of Consultant Otolaryngologist to the South Infirmary-Victoria University Hospital (SIVUH 31 hours per week / HSE 6 hours per week). This appointment is effective from 1st January 2009 and is the permanent replacement for Mr. T.J. O’Sullivan. Dr. Rosemary Murphy has been appointed to the post of Temporary Consultant Radiologist to the South Infirmary-Victoria University Hospital. Dr. Murphy commenced in the post 15/07/08 on a 4 day week basis (Tuesdays to Fridays). The hospital again received a positive casemix adjustment in its 2008 funding allocation from the HSE. This adjustment, in the sum of €329,750, is again a reflection of the high efficiency levels maintained in the hospital. Dr. Peter Kelly has taken the post of Consultant Cardiologist in a permanent capacity from 01/07/08. Delegates rotate through all 4 discussion groups-numbers limited, book early. GPs can request appointments for patients using the SIVUH GP Services web site. At present, this facility includes online appointment requests for the SIVUH Chest Pain Assessment Unit. Other departments will be listed here as they become available. Welcome to Dr. Michelle Murphy and Dr. Michael Murphy who have been permanently appointed to the posts of Consultant Dermatologist and Radiologist respectively from the 1st August 2006. Dr. Michelle Murphy, Dermatologist, has been appointed on a joint appointment basis. She will spend 8 sessions per week in the South Infirmary-Victoria University Hospital and 3 sessions per week in the HSE Southern Area. Dr. Michael Murphy, Radiologist, has been appointed on a whole time basis and will spend his 11 sessions per week with the South Infirmary-Victoria University Hospital. We welcome visitors to the hospital and appreciate the importance of such visits for the well being of our patients. The SIVUH is implementing guidelines as recommended by the Health Service Executive (HSE). Recommended length of visit is twenty minutes. The South Infirmary Victoria University Hospital will no longer accept or allow, floral gifts, or flowers of any kind in patient areas from September 1st 2006. This is in the interest of quality patient care. on Sunday, 24th September 2006 at 1pm. Take the opportunity to raise funds for the Breast Care / Oncology Unit, Gynae/Oncology Unit at the SIVUH and get some exercise! Demolition work commence in June 2006, and work on building the new Unit should commence during August. The new Unit should be in place by July 2007. On March 31st 2006 in Dublin Castle an award was conveyed on the South Infirmary–Victoria University Hospital in recognition of the Pigmented Lesion Clinic. Submissions for consideration were sought by the Department of An Taoiseach throughout the Public Service. In excess of 150 submissions were reviewed by an independent group, chaired by Ms. Marian Finucane. The SIVUH was one of 20 recipients who received recognition for Public Service Excellence from An Taoiseach, Mr. Bertie Ahern T.D. Representing the SIVUH were Mr. Gerard O’Callaghan (Chief Executive), Dr. Fergus Lyons (Consultant Dermatologist), Dr. Michelle Murphy (Consultant Dermatologist) and Ms. Margo Topham (Planning, Development & Strategy Manager). Dr. John Bourke (Consultant Dermatologist) was unable to attend. On 21st February in the Imperial Hotel, Cork a presentation of our project was delivered. This provided the opportunity to explain our service provision and to take questions from the audience. Considerable interest was expressed by both health care and non-health care workers in what we had achieved. This weekly clinic will be held on a Tuesday afternoon. Dr. Michelle Murphy has been appointed to the post of Permanent Consultant Dermatologist to the South Infirmary-Victoria University Hospital. Dr. Murphy will commence duties in this capacity on 1st August 2006. This is a new wholetime permanent Joint Appointment. Mr. Adrian Ireland has been permanently appointed to the post of Consultant Surgeon with a special interest in Gastrointestinal Surgery from 1st January 2006. Dr. Kieran O’Connor has been permanently appointed to the Mercy University Hospital as Consultant Geriatrician from 3rd January 2006. Under his contract Dr. O’Connor has a 5.5. sessional commitment per week to the South Infirmary-Victoria University Hospital. The Catering Department of the South Infirmary - Victoria University Hospital has been awarded the "Hygiene Mark" by EIQA (Excellence Ireland Quality Association). The award was received by the Catering Department in May 2005 and the official presentation of the award took place in the SIVUH Conference Room on Tuesday 4th October 2005. "Achieving this award is a great credit to all of the Staff in the Catering Department. It is also a reflection of the leadership displayed by Pauline Hannafin, Catering Manager, and the strong support given to her by Breda Duff, Jim Seward and Jackie Doody. This award is a recognition of the fantastic work being done by everyone in the Catering Department, and I am delighted to have this opportunity to formally thank everyone on behalf of the hospital’s Board of Directors for their contribution." The Pre-Admission Assessment Clinic opened on the 19th September 2005. It is located on the first floor next to the Day Surgery Reception. All patients (children and adults) who will be attending the New Day Surgery Unit will be pre-assessed prior to admission for local or general anaesthetic in the clinic. On 19th September 2005, the Day Surgery Unit opened. It consists of a reception area, pre-admission assessment clinic, a ward, theatre and recovery room. This dedicated service provides a "one stop shop" for patients undergoing day surgery. There is an integrated team approach to providing an efficient quality service and optimum patient care. On behalf of our Chairman, Mr. Michael Hall, and Board of Directors I wish to thank you for participating in the Ladies Mini Marathon on behalf of our hospital, and for donating the proceeds to our Breast Care/Oncology Unit. All donations received for our Oncology Unit are very much appreciated, and are utilised in the best possible way in the ongoing fight against cancer. Hospital Watch was officially launched at the South Infirmary-Victoria University Hospital on Monday 22nd August 2005. The Hospital Watch Programme is a voluntary programme designed to promote awareness of the potential for crime, to provide information on how to prevent a crime and what to do if a crime occurs. The Hospital Watch Programme operates on the basis of a partnership between An Garda Siochana and the South Infirmary-Victoria University Hospital, and works on the same principle as Neighbourhood Watch. The programme aims to provide a safe environment for patients/clients, visitors and staff. Also, it aims to introduce good security practice and regular communication between staff, security and the local Gardaí to minimise the opportunity for crime within the hospital. The South Infirmary-Victoria Hospital is changing its name to the South Infirmary-Victoria University Hospital, effective from the 1st July 2005. The hospital is changing its name to reflect its academic links with University College, Cork. The first School of Medicine in Cork was established at the South Infirmary in 1811, and the hospital has continued its involvement in the training of both undergraduate and postgraduate medical staff since then. In recent years with the development of the new School of Nursing and Midwifery, School of Pharmacy and School for Allied Health Professionals, the hospital has built even closer links with University College, Cork. It is our wish that these strong links would be maintained and further developed. The name change is also aimed at highlighting the hospital as a centre for academic research. It is the wish of the hospital’s Board of Directors to develop the hospital further in this area. Mr. Adrian P. Ireland will commence as Temporary Consultant Surgeon in the South Infirmary - Victoria Hospital from 1st July 2005. Mr. Ireland will replace Mr. John Kelly, Consultant Surgeon, who is scheduled to retire 30th June 2005. The new Chest Pain Assessment Unit opened on the 4th April 2005. GPs can now complete a referral form available online to refer patients to the new Chest Pain Assessment Unit. See the Chest Pain Assessment Unit department page for more information. We would like to extend a warm welcome to Dr Michael Regan, Consultant Rheumatologist and General Physician, who commenced employment with us on 1st January 2005. The hospital' s new Cardiology Department opened on Monday, 8th November 2004. This department will incorporate a Chest Pain Assessment Unit, ECHO testing area, an ECG recording area and a Stress Testing area. We would like to extend a warm welcome to Ms. Helen Donovan, the hospital' s new Director of Nursing, who commenced employment with us on Monday, 1st November 2004. The hospital was a recent recipient of a prestigious award from the National Irish Safety Organisation (NISO). 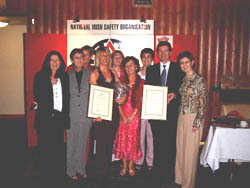 The hospital' s Occupational Health Nurse Specialist, Ms. Regina d'Arcy, also received an award from NISO as Safety Representative of the Year 2004. The Minister for Health & Children, Mr. Micheál Martin, T.D., on 15th September 2004 announced the commissioning of an additional seventeen beds in the hospital' s Medical Rehabilitation Unit for Older People. The Minister for Health & Children, Mr. Micheál Martin, T.D., recently announced the rolling out of BreastCheck to the Southern Region, and the designation of the South Infirmary-Victoria Hospital as the site for the development of a new Breast Screening Unit. The official opening of the Medical Rehabilitation Unit was performed by our Minister for Health and Children, Mr. Michael Martin on the 8th September, 2003. The Unit opened its doors on the 7th July 2003 and is presently a 13 bedded facility. The Unit caters exclusively in Rehabilitation for the older adult and this is welcomed as a new and exciting speciality for the hospital. 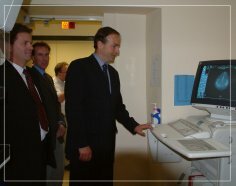 Minister Michael Martin also officially opened the Bone Densitometry Scanner and the Digital Mammography unit in the X-ray department on September 8th, 2003. 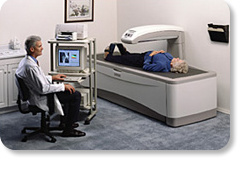 The Bone Densitometry unit uses a Dexa Scanner. These scans are available to the public, without charge, via their GP?s. The Digital Mammography unit is the busiest unit in the city, providing a service to the Breast Unit and to GP?s. 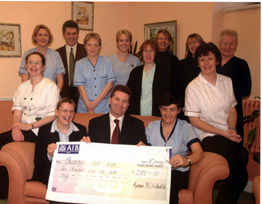 Presentation of cheque for monies raised at Christmas 2002 Night Out by the Hospital`s Social Committee to the Oncology Unit. We would like to extend a warm welcome to Mr Peter O Sullivan, Consultant Otolaryngologist, who commenced his attachment with the South Infirmary/Victoria Hospital ENT Department on 28th July 2003. Dr Clare Murray, Consultant Anaesthetist, commencing 9th September 2002. Ms Deirdre O`Hanlon, Consultant Surgeon with special interest in Breast Disease, commencing 16th September 2002. 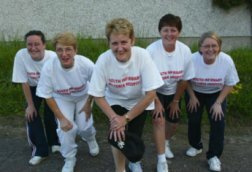 Anyone interested in doing the Evening Echo Ladies Mini-Marathon on Sunday 15th September 2002 for the Oncology/Breast Care Unit can contact the hospital at (021) 4926100 or (021) 4517700. T-shirts and sponsorship cards are available. Voluntary funding is most welcomed by the Board. Picture courtesy of the Evening Echo. New Bone Densitometer Service Available from the end of August 2002. 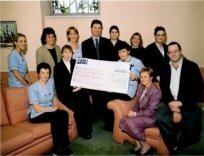 Social Committee present a cheque for €2,458 on 31/01/02 to staff of the Oncology Unit in the hospital. Proceeds were raised as a result of a raffle at the hospital Christmas party night held in December 2001. Minister Micheal Martin officially opened the first Open MRI Unit in Ireland. There are several important advantages of this open system compared to the conventional closed or tunnel design, the major one being reduced claustrophobic sensation. 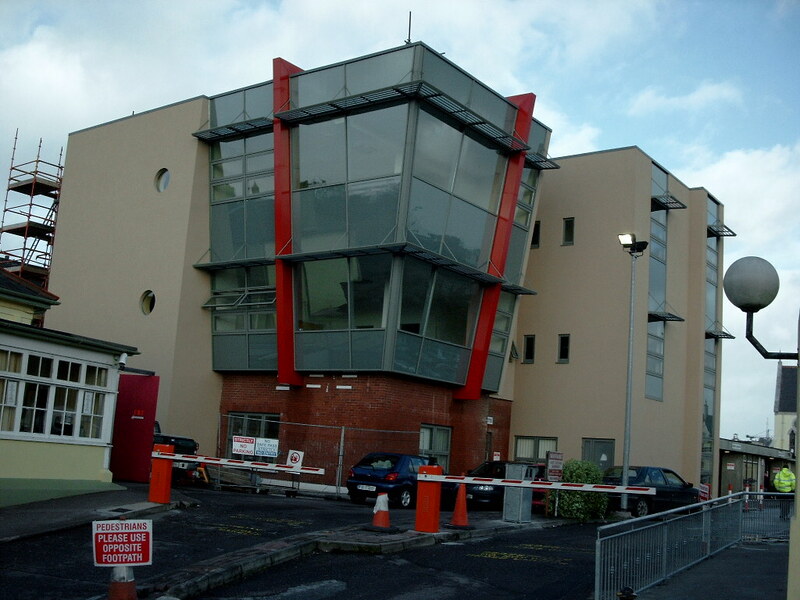 On 21st May 2001 Minister Micheal Martin officially opened the new General Outpatient Department. The new building will improve access to outpatient services for our patients.